My previous experience with Canadian, or much more precise Québécois, Forteresse has been with their more atmospheric side on Par houts bois et vastes plaines. With the subject matter devoted to Quebec rebellion against British colonial powers in 1837-38 Themes pour la rebellion showed a different approach by the band. In a way, with the album they have answered a question if atmospheric black metal can be robust, war themed and almost epic to a point. The resounding and unequivocal answer is “yes”. So this is how Themes pour la rebellion is. An absolutely monumental wall of sound, produced at Necromorbus Studios in Sweden, achieves fantastic gritty guitar sound, crushing everything in its wake. The support comes in a form of a constantly rolling double bass or blasting muscular bottom end. The vocals are pure fire breathing variety, exhaled from the gut to the top of the lungs, calling to battle. And then there are melodies. Maybe not fully noticeable after the first spin due to the shear masculinity of the effort, but pretty obvious, once you lend them an ear. Pride and heroism filled, Forteresse turn these 5-6 min long songs into clarion calls, unfurling the banner of Quebec nationalism. Forteresse action now has moved from boreal forests to the streets of Lower Canada. These songs are not for sissies, something titled Foret d’automne is not an exercise for a fall influenced introspection, and even if La ou nous allons has a quick breathable moment it quickly builds back up to a powerful pinnacle. If I had an issue with Themes pour la rebellion it is its somewhat singular dimensionality. There is little which will distinguish individual songs after the intro Aube de 1837 all the way to the closing floater La dernier voyage. They just come, one punch after another, but it seems that the focus to stay on point took a little away from variety and individual nature of the cuts. 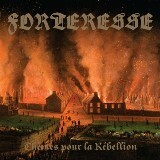 If you like Quebec Metal Noire, of which Forteresse is both a founder and a standard bearer, Themes pour la rebellion is certainly an album you don’t want to miss.